Welcome To The Season Of Gift Cards! With Halloween now behind us, the holiday shopping season is about to enter full swing. It should go without saying that, over the course of the next several weeks, shopping will be at an all time high all over Canada. With so many consumers looking for gifts, it only makes sense to prepare your store for additional traffic. It also makes sense to ensure that you are supplying your customers with one of the most popular holiday gifts there is: gift cards. Gift cards are highly sought-after gifts during the holiday season because they give recipients exactly what they want. With a gift card, a shopper can purchase anything he/she desires for “free”. For a gift card purchaser, the entire act of shopping is made easy. There’s no reason to worry about finding the right item since the item will be selected by the person receiving the gift card. It’s important to promote your gift cards. Just because we have entered the season of gift cards, it doesn’t mean you should rest on your laurels. Remember that you have a lot of competition out there. Be sure to advertise your gift cards so that all members of your target audience are well aware that they can depend on your brand to provide them with all of their holiday shopping needs. 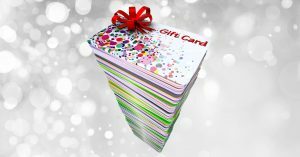 On SquareUp.com, a number of gift card advertising strategies are given. Use social media to boost your gift card sales. It should come as no surprise to you that social media platforms such as LinkedIn, Facebook and Twitter are widely used by businesses to communicate their marketing messages. Don’t hesitate to utilize social media to get the word out about your gift cards. On GiftFly.com, Natasha Miller writes that social media provide great ways of getting your message out to large audiences and fans of your business. Even though your gift card promotions should incorporate heavy internet use, never forget the tried-and-true advertising method of in-store signage. In addition to eye-catching signs that make all visitors of your store well aware that gift cards are available for sale, you need to set up easily recognizable gift card displays. Having them close to your checkout lines is a wise choice. Trust Canadian POS to provide you with your gift card solution! To get all set up for the forthcoming holiday rush, please don’t hesitate to call us at 1-877-748-2884 or email us at info@cdnpos.com.